Spacious Inviting Pool Home With Fantastic Open Water Views! Bring the whole family to this spacious 3 bedroom, 3 bath pool home that sleeps 10. Wide open spaces are found here with the vaulted ceilings and open floor plan. The comfortable furnishings and nautical decor will make you feel right at home. Relax by the pool or enjoy the expansive open water views from the screened upper level deck as you watch the kids frolic in the pool. Sunsets are a true treasure from this home, so don't forget to pack your camera. Available dockage for your boat just across the street with a short ride out to the back country or the ocean for the best fishing, snorkeling, and diving. 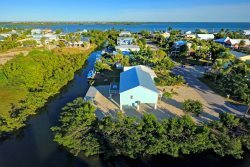 There is so much to do here in the Lower Keys! Shopping is a short ride away. Charter a fishing boat, a snorkel boat, go kayaking, and don't miss the chance to see our beautiful tropical fish at the famous Looe Key Reef. There are an array of restaurants and tiki bars if you need a night out on the town. Be sure to take a day and visit the colorful and quaint town of Key West, only a 30 minute drive. Under certain conditions such as severe weather, fire or other hazardous conditions, or situations involving a particular rental property beyond our control, Century 21 Schwartz Property Sales, Inc. reserves the right to cancel any reservation. If Tenant cancels the reservation, owners or their agent will attempt to rebook the premises at the same rate. If owners or their agents are able to rebook the premises, tenant will receive a refund less a $100.00 cancellation fee. If owners and their agent are unable to rebook the premises, Tenant’s rental payment, excluding departure-cleaning charges, will be forfeited as follows: 100% is forfeited if cancellation is within 60 days of the arrival date; 25% is forfeited if cancellation is more than 60 days prior to the arrival date. Please notify us as soon as possible of cancellation and then send a WRITTEN NOTICE OF CANCELLATION. Please ask the agent about CSA Travel Protection Insurance.